I hereby grant full and indefinite permission for gameplay footage, audio and screenshots from this game to be used for any non-commercial purposess, provided credit is given to me as the creator. "For 16 years we were out in space. Just the four of us. No communications, no news, no home. Counting the days until we could return. But now- now we are back? I wish we were still out there." 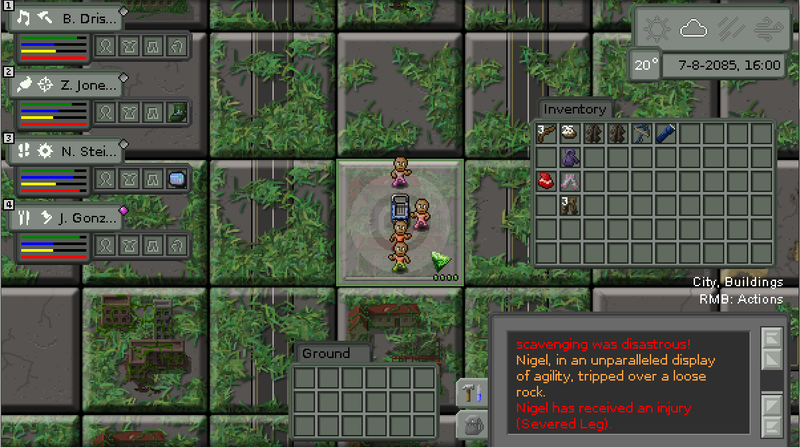 Unchecked Growth is a turn-based, open-ended Roguelike/Survival Sim set on a near- future Earth. Four astronauts, after a decade-long manned exploration mission, return to find the world completely changed. The bustling cities they remembered are gone: replaced by sprawling, silent ruins, overgrown with inexplicably dense vegetation. There seems to be little trace of recent human activity, and even less indication of what may have happened. That is how their story begins. How it ends - and it will end - is up to you. -Randomly generated map to ensure that each playthrough will be different to the last. 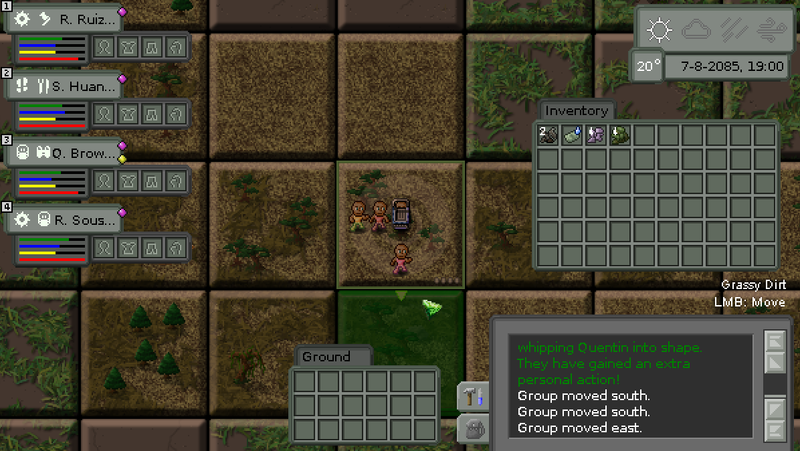 -Control a group of four characters with entirely randomized stats, abilities, and traits. Adapt your game plan to play to their strengths - or see them fall, one by one. -Test yourself against the environment: Battle hunger, thirst, disease and the elements in your struggle to survive. -Make difficult decisions: Who will you give your last ration of water to? Your dying doctor, and last chance of finding vital medicines? Or your only hunter, and chief source of food? -Craft tools and clothes to help you survive. Scavenge abandoned cities for loot. Forage for plants. Send brave explorers into derelict buildings. All items now have correct icons. Updated crafting list with more recipes. Fixed a bug where quick looting crafting items would create duplicates. Added flavour/help text to all items. Fixed item decay and breakage, and repairs. 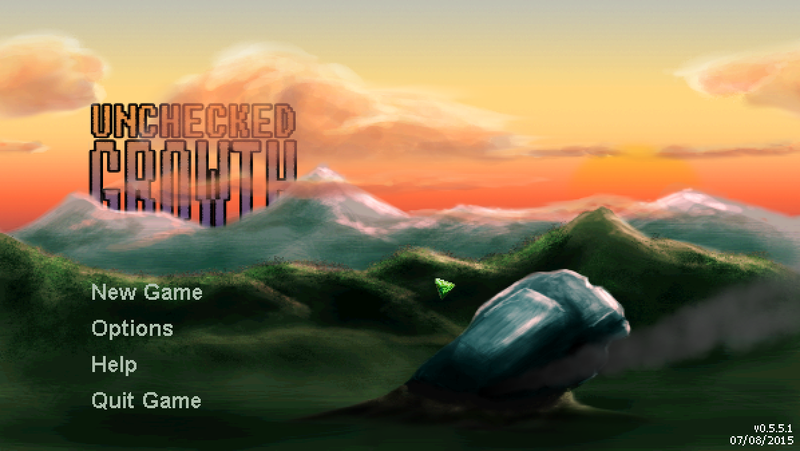 Added proper menu, intro, and game over screens. Balanced hunger and thirst drop. Changed "Pain" bar to "Health", now accurately reflects a character's injuries. Colour-coded the Condition screen to show status of injuries. Fixed loot table anomalies. No, you shouldn't have been getting spacesuits while foraging. Fixed an issue causing graphical artifacts when upscaling. Fixed a bug which allowed dead people to craft things. Tweaked success rates for scavenging. Non-scavengers now have better base success rates but night-time scavenging has been made more difficult. Fixed a graphical bug causing illnesses and injuries to display incorrect colour-coding. Most aspects of the game are mouse-driven. Left click a valid tile to move to it. Right click the currently occupied tile for tile actions. Right click an item in the inventory for the context menu. Shift-left click will allow for single-picking/dropping stackables. Shift-right click to quick loot. Right click a disease or injury for its corresponding context menu. "I" opens inventory. "O" opens crafting menu. Escape opens game menu.